Issue 6 of SRSP-306.4 has been released to incorporate refinements to the minimum antenna characteristics and the emission limits. This SRSP replaces SRSP-306.4, Issue 5. Radio systems using analogue modulation and used for television studio transmitter link (STL) services. 2.1 This Standard replaces SRSP-306.4, Issue 5. Further revision of this SRSP will be made as required. 2.3 The arrangements for non-standard systems are outlined in Spectrum Utilization Policy Gen, General Information Related to Spectrum Utilization and Radio Systems Policies (SP Gen). 2.5 Although a radio system may conform to the requirements of this SRSP, modifications may be required to that system whenever harmful interferenceFootnote 2 is caused. 2.6 When potential interference between radio systems cannot be resolved by the parties concerned, Industry Canada should be advised. After consultation with these parties, the Department will determine the necessary modifications and schedule of modifications to resolve the conflict. 2.7 The Department may require licensees and/or applicants to use receiver selectivity characteristics that provide rejection of harmful interference. 2.8 The use of a two-frequency plan is required. Where reasonable economic or technical justification is provided (e.g. where siting prevents adequate antenna discrimination), extra frequencies may be used to resolve the problem, subject to the provisions of Section 2.4. 2.9 It should be noted that the fixed service shares this band with other services in accordance with the Canadian Table of Frequency Allocations 9 kHz to 275 GHz. 2.10 It should be noted that the radio astronomy service operates in the band 6650-6675.2 MHz solely under the provision of International Telecommunication Union Radio Regulation No. 5.149. Applicants for channels which overlap this band, proposing to operate within the vicinity of the Dominion Radio Astrophysical Observatory (DRAO) near Penticton, B.C. (49 deg. 19' 18" N and 119 deg. 37' 08" W), are encouraged to take steps, where practicable, to avoid causing harmful interference to the DRAO. The radio frequency channel arrangements defined in this Standard provide for six different RF channel bandwidths. Channel pairs are provided with transmit/receive separations of 90, 100, 250, or 340 MHz. Unidirectional radio systems using analogue modulation and used for television STL services are specifically addressed under Section 4.1.2 c. See Table 3 for RF channel frequencies. where n is the channel number and An and A'n are the centre frequencies in MHz of the paired channels. where n is the channel number and Bn and B'n are the centre frequencies in MHz of the paired channels. c. Existing unidirectional radio systems using analogue modulation and used for television STL services must use channels B9 to B12 and channels B'9 to B'12 and may also use channel B13, centred at 6680 MHz. New radio systems using analogue modulation and used for television STL services may also use these same channels provided their operation conforms with the requirements established for digital radio systems in this SRSP. where n is the channel number and Cn and C'n are the centre frequencies in MHz of the paired channels. where n is the channel number and Dn and D'n are the centre frequencies in MHz of the paired channels. where n is the channel number and En and E'n are the centre frequencies in MHz of the paired channels. where n is the channel number and Fn and F'n are the centre frequencies in MHz of the paired channels. The frequencies assigned to a main route system should be re-used where possible on the branching or spur routes. The siting of repeater stations should be planned with this requirement in view, in order that sufficient antenna discrimination is obtained at the branch-off angle. 4.6.1 New bi-directional systems using 10 MHz or smaller channel plans should use the lowest available frequency pair that can be successfully coordinated, starting with channel 1. New systems using the 20 or 30 MHz channel plans should use the highest available frequency pair that can be successfully coordinated, starting at channel 9 or 6, respectively. 4.6.2 New unidirectional systems using the 10 MHz channel plan should use the highest available frequency pair that can be successfully coordinated, starting with channel 25. Such systems using the 20 MHz plan should use channel 13 or highest available frequency pair starting with channel 12. Systems using the 30 MHz plan should use the highest available frequency pair starting with channel 8. 4.6.3 For multi-channel systems, channels should be chosen to minimize the number of wider bandwidth channels that may be blocked. 4.7.1 High and medium-capacity digital systems submitted for licensing shall have a minimum spectral efficiency of 4.4 bit/s/Hz of the RF channel bandwidth on a single polarization. 4.7.2 Low-capacity digital systems submitted for licensing shall have a minimum spectral efficiency of 2.4 bits/s/Hz of the RF channel bandwidth on a single polarization. 4.8.1 Protection channels are not permitted in this band. 4.8.2 Quad-path diversity applications will be considered on a hop-by-hop basis to solve special propagation problems. 5.1 The transmitter power delivered to the antenna input shall not exceed the limits per RF channel shown in Table 1 below. 5.2 An increase in transmitter power over the above specified limit may be permitted if technical justification is provided. In no event will the power delivered to the antenna input be permitted to exceed 20 watts (+13 dBW) per channel. 5.4.2 In any 1 MHz band, the centre frequency of which is removed from the assigned frequency by more than 250% of the authorized bandwidth, the mean power of the emission shall be attenuated by 43 + 10 log10 (mean power in watts) dB, or 80 dB, whichever is the lesser attenuation. 6.1 The co-polarized radiation pattern envelope in the horizontal plane of the antenna must remain within Envelope A defined in Table 2 and shown in Figure 1, for both vertical and horizontal polarizations. 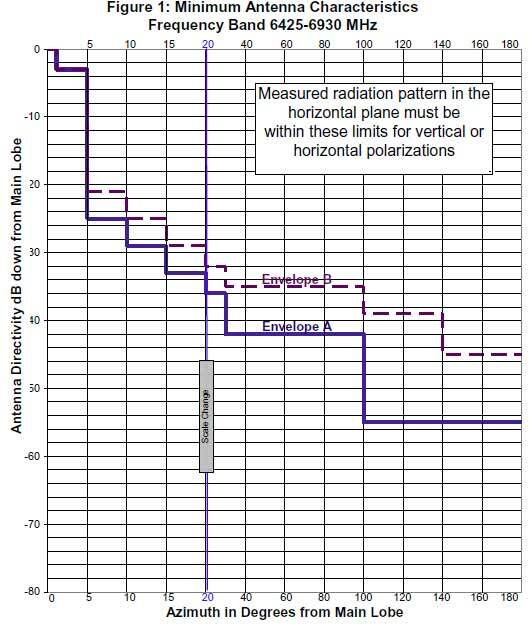 6.2 In uncongested areas, the co-polarized radiation pattern envelope in the horizontal plane of the antenna must remain within Envelope B defined in Table 2 and shown in Figure 1, for both vertical and horizontal polarizations. 6.3 The use of passive repeaters is permitted where a suitable alternative is not practical. The maximum equivalent isotropically radiated power (e.i.r.p.) from the antenna must not, in any case, exceed +55 dBW per RF channel. Where practicable, sites for transmitting terrestrial stations operating in the fixed service, and employing maximum values of e.i.r.p. exceeding +35 dBW in the frequency band 6425-6930 MHz should be selected so that the direction of maximum radiation of the antenna will be pointed at least 2° away from the geostationary-satellite orbit, taking into account the effect of atmospheric refraction. Return to footnote 1 Spectrum Utilization Policy 1-20 GHz, Revisions to Microwave Spectrum Utilization Policies in the Range of 1-20 GHz (SP 1-20 GHz), January 1995, contains spectrum utilization principles including the Geographical Differences Policy guideline. This information will be incorporated into a revision of SP Gen.
Return to footnote 2 For the purpose of this SRSP, "harmful interference" means interference that endangers the functioning of a radionavigation service or other safety services or seriously degrades, obstructs, or repeatedly interrupts a radiocommunication service operating in accordance with regulations and technical requirements laid down by Industry Canada under the Radiocommunication Act .